Saddam Hussein's leadership has been questioned in many research papers. Research papers on the leadership of Saddam Hussein illustrate the type of tactics he used to keep his military and people of Iraq under his control. Paper Masters can custom write on Hussein's leadership or on the man himself. On August 2, 1990, Iraq, led by Saddam Hussein, invaded the state of Kuwait in the Persian Gulf. Exactly a decade earlier, in September of 1980, Iraq went to war against Iran. The prevailing notion had always been that the genesis of these wars was in Saddam Hussein’s violent, megalomaniac character. Indeed, Hussein’s regime has been one of terror, claiming millions of lives and undertaking acts of cruelty both against foreigners as well as against his own people. But although Saddam’s cruelty was brought to bear against his victims and their supporters during the course of both these wars, Hussein did not embark on these military campaigns because he is “bad,” “evil” or “cruel.” Rather, he had embarked on them in order to protect his regime. At the end of the day, it is the goal of a leader to stay in power; in third world, dictatorial regimes such as Hussein’s Iraq, this goal only becomes more manifest. Saddam exploited offensive realism and economic crisis in order to support his warring cause. And, there is no contention that Saddam was cruel, and that he ruled with fear as his weapon. Saddam had been leading a campaign of genocide against the Kurds of the North for many years. Saddam built up a Gestapo-like organization known as the “Fedayeen” to spy and report on his own military commanders and government officials. Stories of his atrocities across the Middle East abounded – from executions of Shia’ fundamentalists in the cities of Najaf and Karbala in 1980, to vigilante-like executions of Egyptians upon the return of Iraqi soldiers to their farms following the Iran-Iraq war, to the use of biological weapons to subdue the Iranians (Ajami), as well as the use of chemical weapons in Iraq’s war against the United States in 1990-1991. But when Saddam had subjected his country to all-out war, it was only out of fear that a true threat to his regime had risen. In what follows, this part first provide support for this assertion. Then, in Part III, a brief overview of the two wars is presented. Part IV analyzes the consequences of the Iran-Iraq and the Gulf War – on Iraq, on its opponents, on the region, as well as on Saddam himself. Part V concludes and Part VI presents a list of references. United Nations - United Nations research papers examine the United Nations and the political history behind it's formation. Bioterrorism - Demographics and biological weapons are other ways of looking at health as security issues. Order a research paper on Bioterrorism from Paper Masters. Cold War Timeline - Iraq and the Cold War - Iraq and the Cold War research papers account how the Soviet Union influenced the political leader Saddam Hussein. 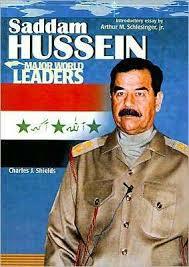 Totalitarian Dictatorship - Saddam Hussein's Leadership has been questioned in many research papers. The Socio-Political Factors of 911 - The Socio-Political Factors of 911 research papers discuss what the terrorist attack did to the United States sociologically. U.S. Army - Iraq and the Cold War research papers account how the Soviet Union influenced the political leader Saddam Hussein. Ayatollah Khomeini - Ayatollah Khomeini research papers examine the man who caused the 1979 Iranian Revolution.